Christmas Crafts, This theme is the perfect example of how something so small can lead to big fun!!! (Open models - Christmas shapes) Trace and cut the shapes of your choice out of heavy cardboard. Keep only the contour. Glue a piece of cellophane paper over the cardboard. Add tiny sparkles to the cardboard contour. Display in a window. (Open models - Christmas shapes) Print for each child. Have them tear and crumple red, green, and white tissue paper. Next, children cover the surface of the shape of their choice with the crumpled paper. 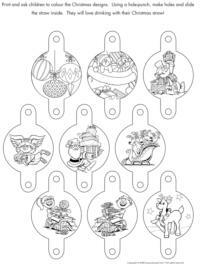 Trace and cut out different sizes of Christmas ornament shapes. (Open models - Christmas shapes) Decorate with sparkles, lace, ribbon, etc. Glue ornaments back to back on either side of ribbon or string. Hang from the ceiling. (Open craft - Santa face) Print for each child. Have them paint a plate red. Have them cut out the eyes, nose, mouth and beard and glue them on their plate. Add cotton balls. Sprinkle glitter over the cotton balls. Cut out the hat, colour it red, and staple it to the plate. 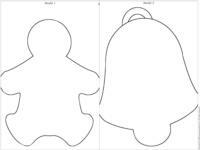 (Open craft - Santa clock) Print and cut out the various pieces. Have children glue the numbers around the contour of the plate, making sure number "12" is at the top and "6" at the bottom. Cut out the two strips. Make a small hole in the center of the plate and use a fastener to attach the hands of the clock. Add the remaining pieces to the plate to make it look like Santa. The plate is his belly. (Open craft - Nutcrackers) Print for each child. Have them colour the pieces and glue them onto an empty toilet paper roll which was previously painted red. Collect boxes of all kinds. Invite children to wrap and decorate them. Next, tie them all together using ribbon. Deposit the train under your Christmas tree. Shape a pine garland into a wreath shape which can be hung on a door. Attach several pieces of candy, candy canes, and ornaments to it using double-sided tape. Cut out the centre of a paper plate, keeping only the contour for a wreath. Decorate with a bow and add string to hang. (Open Christmas badges) Print and cut out the badges. Each child chooses a badge and colours it. Laminate or cover with transparent adhesive paper. Use a hole-punch to make a hole and thread string through it. Trace the outline of a large Christmas tree onto a piece of cardboard. Provide your group with several catalogues and flyers they may tear and crumple. Have children fill the tree, gluing the paper balls to it. First, using white poster paint, children paint both sides of four popsicle sticks. Add sparkles before the glue dries. Once the paint is dry, glue two popsicle sticks together to form an "x". Add the third and fourth popsicle sticks transversally and set aside to dry. Finally, using invisible thread, hang snowflakes from the ceiling. You may choose to have each child paint several popsicle sticks to have many snowflakes to hang in your daycare. Cover Styrofoam balls with aluminum, metallic, or tissue paper. Bend a paper clip to form a hook. Wrap a coffee cream cup with aluminum paper. Insert a pipe cleaner through the bottom of the cup. Attach a small bell to the part of the pipe cleaner which is inside the cup and form a hook with the other end. Hang in the tree. Tear, crumple, and glue red, black, and white tissue paper on the various Santa Claus parts. (Open craft - Santa Claus) Add cotton balls for the beard. Assemble using fasteners or string. Ask children to cut a triangle out of construction paper for their Santa hat. Have them glue the triangle to the top of a paper plate. Then, they can draw Santa's face and glue cotton balls for the beard. Hang from the ceiling. Cut a red pipe cleaner and a white pipe cleaner in two. Twist them together and lightly bend the end to give them a candy cane shape. Trace a candy cane shape onto construction paper. Cut it out and add crumpled pieces of red and white tissue paper to it. 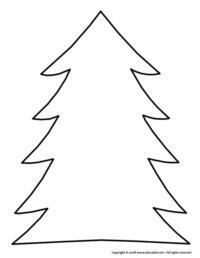 (Open model - Christmas tree) Print and trace the model onto green cardboard. Cut out. Smooth glue onto the surface of the tree and add real pine needles. Decorate. You may add glitter. Cut Styrofoam balls in two. Have children decorate as they wish. Prepare a background by taping a large piece of wrapping paper to the wall and take pictures of the children. You may simply take pictures in front of your Christmas tree if you prefer. Glue their picture onto their Styrofoam ball. You may choose to varnish the balls. Insert a pipe cleaner and bend to form a loop so they can be hung in the tree. Purchase a white paper tablecloth. 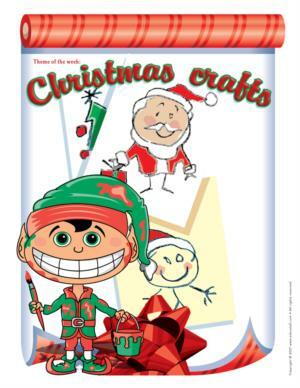 With your group, cut out Christmas images from wrapping paper, magazines, catalogues, etc. Glue them to your tablecloth. Children will love their Christmas meal. (Open model - Star) Print and cut the model out of cardboard. Next, trace it onto construction paper. Children each cut out a star and decorate it with tinsel. Hang from the ceiling. Pour a small quantity of water into aluminum pie plates. Add sparkles, food colouring, pieces of tissue paper, etc. Add string, making sure one end touches the water and the other end hangs over the side of the plate. Freeze outdoors. Remove the frozen decorations from the pie plates. Hang them on a fence. Use small brown paper lunch bags. Do not open them, they must remain folded. Children trace both their hands onto brown construction paper and cut them out. Glue their hands to the end of the bag to represent the reindeer's antlers. Glue eyes, a nose, and a mouth. Children may paint the bag to decorate their little reindeer. 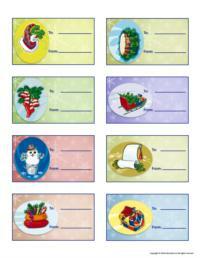 Provide children with paper napkins which have a variety of Christmas designs on them. Have children cut or tear small pieces. Apply glue to Styrofoam balls and cover them with the napkin pieces. (Open Christmas garland) Cut out the garland models. Place them, one at a time, on folded sheets of paper. Cut out the shapes, leaving the sides uncut. When you unfold the paper, the shapes will remain attached thus making a garland. Fill a balloon which has not yet been inflated with a variety of small Christmas objects which can fit into the opening (sparkles, confetti, ribbon, etc.). Next, fill the balloon with water being careful not to inflate it too much. Knot the end and place the balloon in the freezer. Turn it a few times to ensure the objects are spread out during the freezing process. Once completely frozen, use scissors to make a hole in the balloon and remove it. You will have a beautiful frozen Christmas ornament which is perfect as a centerpiece. Each child may prepare his own centerpiece and add the water at home. Combine water and salt. Add flour. The dough must remain supple and elastic. It mustn't stick to your fingers. If it does, simply add flour. Create the desired shapes: wreath, ornament, plate, centerpiece, etc. Baking time will vary (1 hour to 1 ½ hours at 250⁰F) depending on how thick the shapes are. You may also let the shapes air dry but this requires several days. Varnish or paint the shapes, using two or three coats. A few tricks. To attach pieces together, simply add a small quantity of water with your fingertips. To prevent your shapes from sticking, cover the surface with flour before you start. You may use a toothpick to make a hole in your shape if you wish to hang it. The tips of paintbrushes may be used to create small details. Cookie cutters are great for creating interesting shapes. Set different sizes of marshmallows on the table. Tell children they are snowballs and they may use them to make snowmen. They may join them with icing or toothpicks. A cookie may be used for the base. Candy is great for the eyes, nose, and mouth. A piece of liquorice makes a cute scarf and pretzels are perfect for the arms. Give each child a sheet of white construction paper. Add a small amount of water to red Jell-O powder. Have children paint a candy cane using their fingers. As a group, melt marshmallows in the microwave oven for 30 seconds. Let children take turns stirring. Return to the microwave for an additional 10 seconds. Deposit the melted marshmallows in the centre of the table. Using popsicle sticks, children spread the marshmallow mixture onto a piece of red cardboard. Add wiggly eyes and a small pompom for the nose. Give each child a leak proof glass jar (like for jam). Have children create small shapes using modeling dough or use small Christmas figurines. Be sure they fit inside the jar. Use hot glue to set the figurine or the shape to the cover of the jar. Fill the jar with water until slightly more than half full. Add sparkles. Tightly close the jar and seal with hot glue. Turn the jar over so the cover is on the bottom. Shake and watch the snow fall. Give each child a wooden clothespin. Have them paint it red and set aside to dry. (Open models - Christmas place cards) Print and trace the various models onto construction paper. Children cut out the pieces and glue them together according to the chosen model. Write the name on the body and glue it to the clothespin. Decorate using pompoms for the nose, wiggly eyes, etc. Fasten the clothespin onto a Christmas napkin. 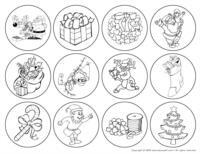 (Open Christmas designs) Print and ask children to colour the Christmas designs. Using a hole-punch, make holes and slide the straw inside. They will love drinking with their Christmas straw! Use two Christmas paper plates. Cut one of the plates into two equal parts and discard one half. Apply glue to the contour of the cut plate. Place the two plates face to face and stick them together. Once they are glued together, punch holes around the portion of the plate which did not have glue applied to it using a hole-punch. Begin at the top and lace the plate using Christmas ribbon. Add sparkles to decorate. (Open Christmas napkin rings) Print and cut out of cardboard. Decorate with stickers and sparkles. Make incisions at each extremity and insert them into each other. Slide a napkin into the ring. Remove the label from a metal can. The edge must not be sharp. Children cover the can with construction paper or paint before adding decorative accents. Parents will love receiving this holder as a gift. Each child paints a wooden spoon white. Make a nose out of modeling dough and let it dry. Cut a hat shape out of black felt. Once the nose is dry, glue it onto the spoon and draw the remaining details. Use pink chalk to add a touch of pink to the snowman's cheeks. Glue cotton balls to the handle for the body. Add tiny black buttons. You will need pastel-coloured facecloths and acrylic paint. Children paint their hands and make prints on their facecloth. Write the year and children's name. This craft is a nice souvenir for parents. Take pictures of children wearing a Christmas hat, standing in front of a Christmas decor. Cut a frame out of cardboard and have children paint it. Glue magnets to the back. Make a print of children's feet with brown poster paint. The heel becomes the reindeer's nose. Next, print each of their hands on either side to represent the antlers. Set aside to dry. Add wiggly eyes and a tiny red pompom for the nose. Make a cone using construction paper. Take children's picture. The pictures can be used for the face. Cut them out and glue them to the cone's point. Children trace and cut out their hands and glue them on either side of the cone to represent wings. You may even add feathers to the wings or the cone. Have children paint coffee filters red. Once dry, have them cut small slits in the coffee filters. Tie them in the centre using a green pipe cleaner. This craft looks beautiful on a gift, in the Christmas tree, or even to decorate the dinner table. 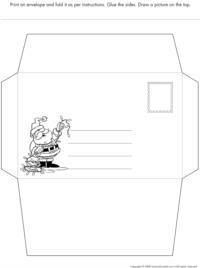 (Open Christmas envelope) Print an envelope and fold it as per instructions. Glue the sides. 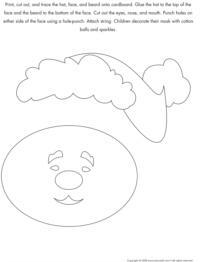 Draw a picture on the top. Cut out a piece of paper big enough to wrap an empty toilet paper roll. Fill the roll with candy or a small gift. Roll it up in paper and knot the ends with ribbon. Each child decorates a brown paper lunch bag like a house and uses it to wrap a gift. (Open model Christmas house) Cut, colour, and glue the shapes for the door, windows, roof, and chimney. Add the gift, fold down the top of the bag, and add a folded piece of construction paper for the roof. You may use decorative scissors to trim the edge of the roof. Cut off the top of an empty 1 or 2-Litre milk jug. Paint the surface or wrap it with construction paper without covering the top. Add glue and Christmas sparkles. Staple ribbon to opposite sides of the jug to create a handle. Add the gift and cover it with tissue paper. Give each child an old shoe box. Let them paint it or cover it with wrapping paper. Use this creation for a handmade gift. Cut the shape of a Christmas stocking out of felt. Print the following model (Open lacing - Christmas stocking) Make holes around the contour using a hole-punch. Have children thread a piece of yarn through the holes. Once done, they may fill their stocking with treats and give it to their parents for Christmas. We have prepared two sets of printable Christmas cards. One is black and white (Open cards - Black and white Christmas cards). Have children colour and fold their card themselves. We also have cards with colours. Simply print (Open cards - Christmas cards colour). (Open mask - Santa Claus) Print, cut out, and trace the hat, face, and beard onto cardboard. Glue the hat to the top of the face and the beard to the bottom of the face. Cut out the eyes, nose, and mouth. Punch holes on either side of the face using a hole-punch. Attach string. Children decorate their mask with cotton balls and sparkles. 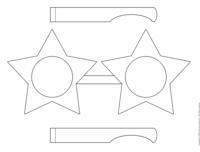 (Open Star glasses) Print the model and trace it onto heavy cardboard. Cut out the interior of the star and add red or green cellophane paper. Use one egg carton cavity. Paint the nose red and let dry. Make a hole on either side, thread ribbon through the holes and knot. Have your little reindeer wear their red noses. (Open reindeer antlers) Print for each child. Attach the antlers to a strip of red or brown construction paper and staple to fit around children's head. Decorate. Cut out a strip of cardboard long enough to fit around each child's head. Inflate two rubber gloves and attach them to the strip of cardboard.